Burgundy is in the heart of France and is indeed a very peaceful rural region. Much of the region’s prosperity today is mainly due to its wine production. The fertile land of Burgundy has helped in the growing of its vineyards, forests, and farmlands. The wine cultivation was earlier run by religious sections, but has now been taken up by the wealthy population. The area is also popular among shoppers. The diverse geography of the Burgundy region is reflected from the granite Morvan park in central Burgundy to the limestone based Saone valley in the South. The region has about 1200 km of rivers and canals. Therefore, you find visitors come to Burgundy for canal boat holidays along its fabulous waterways. Rivers such as Saone and Yonne are part of the navigable waterways network, which include the Burgundy canal. Water sports are very popular in Burgundy given its innumerable lakes, streams and waterfalls. There is canoe-kayaking, sailing and rafting. A canal cruise via bateau-mouche or flyboats are both very nice experiences. Apart from walking, one can also cycle along the canals. Although the region has comparatively lesser economic role with fewer industries, the standard of living is good. The region may not be popular with foreigners looking for a second home, but in recent years it has seen increased interests from Parisians who look for weekend holidays. Burgundy is only about 100 km South of Paris, and is well connected with the north and south by motorways and the high speed TGV. Burgundy is not only sought by wine connoisseurs, but also by people who appreciate architecture, and others who seek sports, entertainment and various other activities. The capital of the region Dijon has the Palace of the Dukes of Burgundy or Palais des Ducs de Bourgogne which is not only a tourist attraction but also a civic center. The palace has a Fine Arts Museum showing medieval sculptures and paintings. Other notable places in Dijon are the Cathedral Notre Dame, which offers unique nighttime views and which has the owl sculpture on the church wall on which you could place your right hand and make a wish; Saint Michel and the indoor market. Dijon is also the mustard center of the world and has a mustard museum, Musee de la Moutarde. Incidentally, Dijon is also the birth place of Gustave Eiffel who built the Eiffel Tower in Paris. Dijon has the largest number of buildings that are over 300 years old. 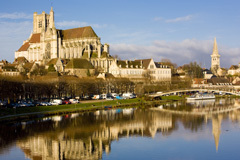 Vezelay, a charming medieval town is a UNESCO World Heritage site. The simple and peaceful town is perhaps best known for the Basilica of St. Mary Magdalene which is the largest and best preserved Romanesque church in Europe. Its architecture includes sculptures of the saints, sinners and bible incidents. Beaune is the center for wine production and is called the ‘Golden Gate’ of Burgundy for the great wine it produces. 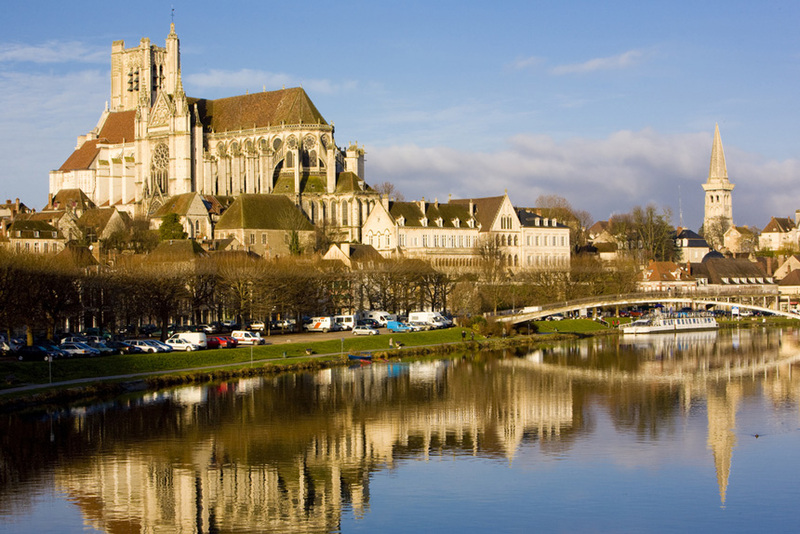 The town includes several museums like the museum for wines occupying a 15th century building which was earlier the meeting spot for the Dukes; the Musee des Beaux-Arts; and the Jules-Marey Museum for video photography. The town of Magny-cours is well known for its racing circuit and is home for the Formula 1 Grand Prix. Châlon sur Saône is excellent for photographs, given its location on the Saone River. The town’s ‘Voie verte’ path is ideal for walking, skating or cycling, away from the road traffic. Bicycles and mountain bikes can be hired here and facilities like parking, picnic area, toilets, shelters etc. are available along the path. There are over 24 cycling routes across small roads, which see less than 1000 vehicles per day. Burgundy has a rich history with the Burgundians being amongst the Germanic people who came to power immediately after the collapse of the Roman Empire, in the Western region. They crossed the Rhine in 411 and set up their own kingdom in Worms. The kingdom kept expanding mainly due to the frequent clashes among the Romans and Huns, and the Burgundian kingdom included the border areas of today’s Italy, France and Switzerland. Godomar, the last Burgundian king was defeated in 534 by the Franks. When the dissolution of the Frankish Empire occurred in 880, the dynastic succession came to an end, leaving four Burgundies. The four Burgundies were the Kingdom of Upper Burgundy around Lake Geneva, the Kingdom of Lower Burgundy in Provence, the Dutchy of Burgundy west of the Saone River and the County of Burgundy at the east of the Saone River. The Upper and Lower Burgundies were joined in 937, incorporated under the Holy Roman Empire in 1032 under Conrad II and called the Kingdom of Arles. In 1477 the Dutchy of Burgundy was invaded and brought under its control by the French throne. The County of Burgundy was incorporated into France in 1678 by the Treaty of Nijmegen. Burgundy was a crucial region in the late 15th and 16th centuries, for the rise of the Habsburgs, subsequent to the marriage of Maxmilian of Austria into the Dual household. In 1477 Burgundy came back to France after the death of the last duke Charles the Bold in the Battle of Nancy.